Uber has confirmed it has appointed Dara Khosrowshahi as the firm's new chief executive, following a unanimous vote by its board. The former Expedia chief executive will meet with staff for the first time on Wednesday, a statement from Uber said. Mr Khosrowshahi's appointment ends months of speculation about who would take the top job at the troubled firm. He replaces co-founder Travis Kalanick, who resigned in June following investor pressure after months of turmoil. Mr Khosrowshahi came to America when he was nine years old, after his family fled Iran on the eve of the Iranian Revolution. In 2005, he became chief executive of the online travel site Expedia, which operates in more than 60 countries. 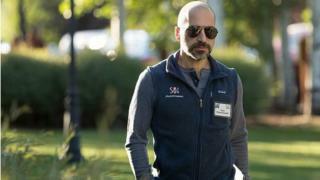 In a email to staff posted on its website late Tuesday, the company said it was confident Mr Khosrowshahi was "the best person to lead Uber into the future." The announcement was widely anticipated, as Mr Khosrowshahi had already told US news outlets he planned to leave Expedia for Uber. He told Bloomberg News he was aware of the challenges, but was interested in working at a company that is "redefining the transportation industry". "Are there difficulties? Are there complexities? Are there challenges? Absolutely, but that's also what makes it fun." "I am not in this to coast. I'm in it to get my hands dirty and build a team and do something that people will look back on with tonnes of satisfaction," he said. Mr Khosrowshahi earned about $2.5m in total compensation at Expedia last year. His pay has fluctuated wildly because of stock options. In 2015, he earned more than $94m in total compensation, primarily due to stock awards. Mr Khosrowshahi will face a number of challenges in his new role, as he seeks to improve both the bottom line and the company's tarnished image. Uber said on Tuesday that it is cooperating with a US probe into possible bribery law violations. Mr Kalanick left the firm in June after clashes with regulators in many countries, a trade secrets lawsuit and controversies about sexual harassment.